Today is Creative Inspirations Paint day on my blog! 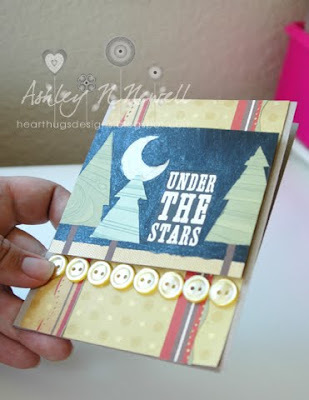 :) This week, we were given a challenge to make an "into the woods" themed card with plastic or metal embellishments. Ok, so I think I took the theme a little more literally than I could have. I heard unto the woods and I thought, I'll just make a card with a forest on it. I guess I could have thought outside the box a bit. My card uses elements from Cosmo Cricket's Mr Campy. I used one of the papers as the background and did a couple stripes of paper that I punched the edge on. Then I took this journalling bit from the kit and dressed it up with paint. On the moon, I painted Creative Inspirations Paint in Citrus. On the black sky, I used the color Coal. 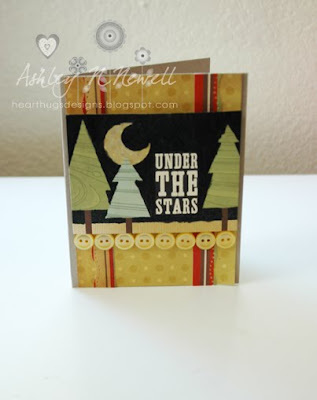 I love how it adds so much shimmer and dimension to this card. But even with the shimmer (especially since it's not glitter), this can still be a very masculine card. For the plastic embellishment element, I chose to use buttons. And here's a second picture to show you the absolute fabulous shimmer the paint gave. I wish I had taken a before picture of the journalling scene, because while it was very cute, it is just so special now! Isn't that fun? Ok, don't forget to check out the AMAZING inspiration that the design team has created for you today by going to the CREATIVE INSPIRATIONS PAINT BLOG. Have a great day! Super card, I like the button treatment and sentiment, brilliant shimmer on the sky!! I love your literal interpretation! That shimmer sky is amazing and I love the button border! I love your interpretation of the theme- what a great forest you have creates- the shimmer is wonderful! I'm making my card tonight! I'm a bit behind! What a fun and inspiring card. Love your take on this challenge and the dp is fabulous. Super duper cuteness!! Love it!! Love the shimmer! I like your interpretation, kind of what I was thinking when I read the challenge. Great job! Great take on the challenge - your shimmery forest looks wonderful! Love the card Ashley, I like what you did with the sky. Pretty cool. Cool interpretation of the challenge. I love the trees and the shimmery sky.